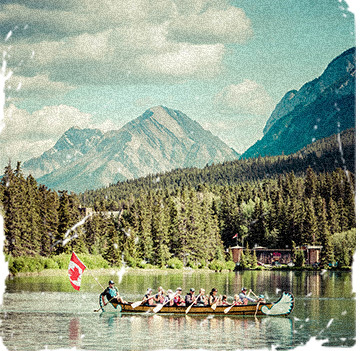 Enjoy the serenity of the Bow River and marvel at the surroundings whilst on a Big Canoe Tour. 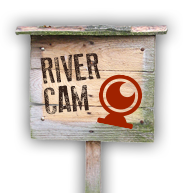 As you journey upstream, our guides will entertain you with stories of the past, history of canoeing and interesting local facts. Every tour includes life jackets and paddles plus instruction on how to paddle as a team. A Big Canoe Tour is perfect for the whole family and no paddling experience is necessary. 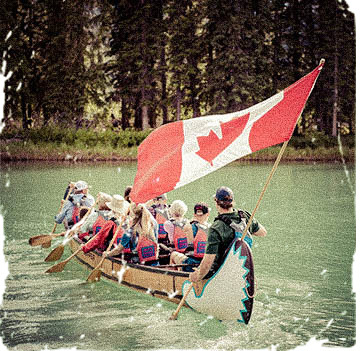 It’s a fun and interactive way to explore the waterways of Banff National Park. Discover life on the Bow River. Join us on an early evening or morning Big Canoe tour and learn fun facts about animal habitats, behaviors and conservation. Escape the bustling Banff Streets and get5 back to nature. Enjoy paddling up the scenic Bow River while keeping your eyes peeled for some of the locals - bald eagles, elf, muskrats and maybe even "Barry" our resident beaver. Learn best practice for wildlife encounters and discover the challenges they face with increasing human interaction. You can’t get a more scenic backdrop for an interpretive wildlife tour. It’s fun for all ages! Tour includes a souvenir to take home.